After all, many Filipinos regret demanding — and gaining — independence from the United States back in 1946. Now they live with the reality that had eventuated from the prescience of the late Manuel L. Quezon, first President of the Philippine Commonwealth when he said: “I would rather have a Philippines run like hell by Filipinos than a Philippines run like heaven by the Americans”. 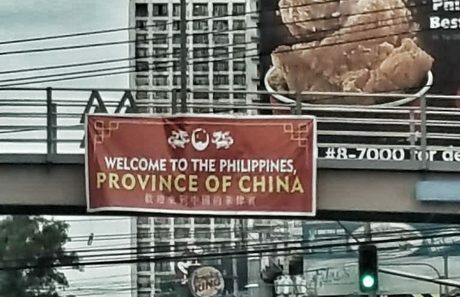 Today, a group of bozos are putting up tarpaulins all over Manila with the words “Welcome to the Philippines, Province of China”. For me that sounds a lot more like wishful thinking than the tongue-in-cheek call-out its instigators likely wished to convey. It’s not as if Filipinos have ever actually been “independent” in the real sense of the term. Everything that underpins any semblance of modernity in the Philippines is made possible only by foreign capital. Major brands are foreign, funding of new infrastructure is foreign, and all those precious factories and BPO centres that soak up unemployed Filipinos are made possible only by foreign-originated technology and demand. The Philippines’ style or form of government itself is straight-out-of-the-box foreign in origin with negligible local thinking-added-value input into its crafting and implementation. From leftist “activism” (which traces its ideological roots to a German and the local flavour to a Chinese), to liberalism (Western European), Filipinos practically owe all of the veneer that is their “modern” identity to foreign colonial powers. Even the state religion — Roman Catholicism — is not only a foreign religion that was originally a tool for subjugation of the colonies, it is a channel through which a foreign government — the Vatican City — continues to govern the Filipino flock even today. The one centre of power that is domestic is the Philippine government — which further highlights just how prescient Quezon’s words turned out to be. And even on that, the Philippine Opposition are combatting it using foreign intellectual capital (liberalism and communism and the quaint artifacts of these ideologies: “human rights”, “feminism”, and “equality”). So what then of the idea that the Philippines is in some sort of danger of being a “Province of China” as some shrill activists presume to scare Filipinos into believing? It’s not as if another colonial master will matter in the bigger scheme of things. Long before the Duterte presidency, Filipinos already consumed tonnes of imported Chinese food and enjoy a throwaway culture on a diet of cheap imported Chinese garments and trinkets among other things on top of all that foreign-originated stuff. Indeed, the more confronting reality at work here is the fact that Filipinos had only their rustbucket navy to defend themselves with as China started building stuff on disputed territory in the South China Sea. The state of that navy attests to how “serious” Filipinos actually are about defending what they assert is “theirs” to keep. Indeed, nearby Indonesia could simply decide tomorrow to do the same and there would be not much Filipinos could do about it other than issue another set of re-worded template “activist” slogans. For many of the dime-a-dozen “activists” that now infest the Philippines’ political discourse, being “cause-oriented” doesn’t go much further than wearing a shirt — or declaring some form of “protest” on social media. This is because being seen to be aware of “social justice” issues and parroting a slogan in support of the popular position on an issue earns social brownie points. It’s called virtue signalling — a term that has come to be associated with the easy space in the discourse where “polite conversation” dominates. Thing is, when someone says “I DISSENT” always ask “Then what?” Perhaps, to be fair, it is a bit concerning that many Filipinos now think that the Philippines is “destined” to be a “province of China”. So they are encouraged by their so-called “thought leaders” to protest loudly or hang these quaint banners with their supposedly tongue-in-cheek message to express their passive-aggressive “outrage”. But no matter how loud the shrill voices or how big and expensive the banners are, the question Filipinos will ultimately need to confront remains simple: And then what? The REAL question is who REALLY owns the Philippines? Is it the Filipinos? I guess not and why? That’s because we, the Filipinos didn’t love & pay respect to our beloved country, Filipinos have these so called crab & colonial mentalities and unlike the Arabs, Germans, Koreans or Japanese, our country is not a hegemony nation. It is ruled by different ethnics/races like Filipino-CHINESE, Ilocano, Cebuano, Illonggo, Waray, Bicolanos, etc., etc. In other words, Philippines is a part of the provinces of many tribes/ethnics, foreigners and soon, Aliens from another planet from the past up to the future. Philippines is a free-for-all ownership, anyone can own it. ???????? Maybe the Philippines is also the “Province of Africa”? ???? China might well have its eye on the Philippines resources. I suspect the only reason they haven’t invaded already is that they can’t be bothered to deal with 100 million oxygen thieves. Expansionist empires historically had a simple, effective and very unpleasant solution to that sort of dilemma. So Filipinos might want to get their act together if they want to avoid that potential outcome. However small the possibility may be, it’s not zero. Why invade and waste bullets when you can simply invest and lend money, right? Or let the Gilas Pilipinas do the dirty work just like what they’d done to the Australian Boomers on FIBA World Cup Qualifying Match last July 2, 2018. We’re already a “pikon” (sore loser) monkey… I mean, people. ???? Exactly, Mr. benign0! And that is what’s happening right now. Foreign investments and foreign lending are granted not without conditions set for the borrower country, in this case, The Philippines. The impact to Duterte’s China-funded Build! Build! Build! modernization program will not be entirely free of hidden economic setbacks. With every government projects wherein the conditions are the mandatory utilization of Chinese technology and technocrats, engineers, managers… you can just imagine how the borrowed money goes back to China with interest. If you will recall the very reason given then by the Aquino administration in denying Mr. Daniel Dingel and his invention, it was due to the conditions, in exchange for the grant of loans, as imposed by the World Bank and the IMF. Oh good grief. Filipinos are still the only people on the planet who believe there’s such a thing as a “water-powered car”. At least when the Chinese take over they’ll probably set up some proper schools. The funny part is, they’re not even doing that. At least not on any serious scale. The Chinese are more interested in doing deals with the worst hellholes in Africa than with a country in their own backyard. They’re also going into countries like Laos and Vietnam and making lots of money (although I suspect the locals aren’t getting such a great deal). I think that says a lot about the prospects for the Philippines: even hard-nosed Chinese businessmen, who aren’t strangers to cheating, lying and strong-arming their way to a profit, won’t touch the place with a ten-foot pole. Whatever else the Chinese might be, they’re pragmatic: I think they know full well that every businessman who comes to the Philippines ends up being stabbed in the back (literally or metaphorically) and leaves with his tail between his legs and a much lighter bank account. As the saying goes: if you want to make a small fortune in the Philippines, start with a large fortune. As Chino said, it seems they’ve chosen to just steal the bits they want, and leave the rest alone. Thing is, money is like a fluid — it seeks its own level following a path of least resistance (which is why rivers and other water channels are crooked rather than straight). Filipinos take the behaviour of money too personally in that regard and expect it to behave on the basis of their “moral” sensibilities. >> Filipinos take the behaviour of money too personally in that regard and expect it to behave on the basis of their “moral” sensibilities. That’s very true. I’ve noticed that. Filipinos have a very, very unhealthy attitude to money, and they don’t seem to really understand what it is or how it works. As you said, they seem to think it “ought” to do certain things – in particular, that it’s morally right and proper that it should flow predominantly into their own pockets rather than others’. Oxygen, thieves, lol. China’s already doing the annexing of islands for the purpose of supporting their more than 2 billion people. Why add another 100 million-plus headaches? The Chinese love our pure crystalline white beaches – the best in the world. China can simply move their 9 dash line to include Palawan, and move in like how Russia annexes smaller entities like crimea. A slap on the wrist by the US through a year of trade sanctions, and its back to biz as usual. By their own undoing, Filipinos get owned. You can also argue that the movements back then during the Spanish and American colonial periods had groups that argued for the Philippines to be a Province/State to Spain and the US, say what you can about them, but you have think about if they had foresight that the Filipinos were incompetent, divided and tribalistic people that would drive back everything we were provided for and just replace a Foreign Master to a Native one, why choose the corrupt but competent master to a naive and incompetent local master. And there’s the argument of spoiled and entitled Yellows, why the support the Globalist Liberal Hegemony and Status Quo where they continue with their narrative that all was fine when their chosen Liberal Parties were in power in their respective countries. Lastly the Duterte Administration is still trying to put a multipolar foreign relationship to all countries while being neutral enough to just focus on his home state that has everything crumbling, people should ignore the pathetic armchair nationalist internet warrior that has the guts to want to confront a foreign power for perceive slights because of the Media instead of the long-decades decline and corruption in the entire country. This banner is obviously made by an amateur who has a relatively poor grasp of Chinese and international affairs. The statement in Mandarin, from what I can garner, is 歡迎來到中國的菲律賓. This literally translates to “Welcome to China’s Philippines,” which just sounds childish. To add, it is also written in traditional script, the script that is commonly used in Taiwan, HK, and Macau. Does this mean that the Philippines is a part of Taiwan i.e. the Republic of China or HK or Macau. If these idiots were more polished, they should have written it as 欢迎来到中华人民共和国菲律宾省。That way we, more suave individuals would know exactly what they are trying to convey. But I must digress, whoever is doing this is clearly a first-class idiot. I would translate that as something like “Welcome [visitors], to the Philippines, which is owned by China”. But yeah, it’s grammatically weird, and it makes you wonder what they were trying to say. Upon thinking about it, what’s the point of these bozos doing it if it was for spreading Sinophobia and fear-mongering? Even one of my friends, who is a Yellowtard, even shared a post from none other than Florin Hilbay. I even get rid of that post. Not all the Provinces of China are doing well. There are Provinces that have people live,” as poor as rats”. Maybe Filipinos are sadomasochist. They love to be colonized and to be oppressed by foreign oppressors. We have only to impose a good tariff on cheap Chinese goods; produce the goods ourselves. Then, we can give good jobs to people, with dignity. Not going to foreign countries, working as OFW slaves for a pittance pay of a few U.S. dollars per day. I don’t believe that foreign colonizers can solve the problems of Filipinos. Most Filipinos are the part of the problems, themselves. Most are not part of the solution. If Filipinos have a ” mendicant mindset” and an “easy money mindset”, and if ” Filipinos are the part of the problems, themselves”, how do you suppose you can produce goods and employ people? Incompetent employees can’t produce anything. Never give a clown too many balls to juggle.